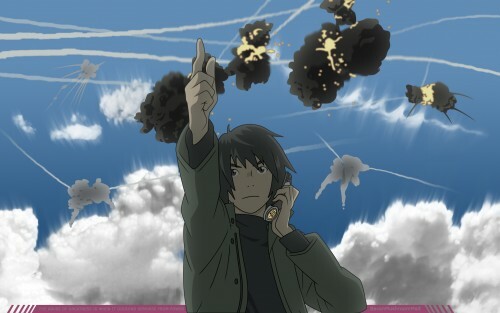 This wallpaper is made out of several elements from a scene in the the final episode with the explosions rearranged and such. Thanks to pixlpusher for the cloud brushes. This wallpaper is named after the first Eden of the East movie coming out in November. Browse Eden of the East Gallery: Recent | Popular. I loved the scene in the last episode and I think you've completely captured it in your wallpaper. The streaky stuff coming out of the clouds are a bit odd but the explosions look pretty good! Thanks for turning it into a wall! I have to agree with Kara. The wallpaper itself is pretty cool - I really like the scene you've captured. My biggest issue is the bright pink lines, the background of your credit. It's very obstructive. May just make it might and soft light it or make it black and overlay it... something that doesn't scream "This is ridiculous!" Other than your credit thingy, I think this is pretty nice. oh god! this is great! I love it! i love it! great work! i love takizawa kun! I hope i can know his real name someday xD he looks so cool there! thank u a lot for sharing! good one, i like it, thanks! this scan is totally awesome! lol! i have never seen the anime but i have seen a video clip that some1 made! just think i'm alreadysuch a huge fan! lol! thnks 4 sharin! me encanta esta serie y esta imagen es genial. Very high resolution, very sharp, thanks! I adore eden of the east! It's one of the greatest series i've seen!